Happy to share that DD Free Dish will be resuming e-Auctions to allocate DTH slots based on a revised policy. Thankful to the Prasar Bharati Board which cleared the new policy and to Secy MIB for support to the same, under the guidance and leadership of HMoSIB Col Rathore. DD Free Dish DTH Platform according to latest market estimates has a base of 30 million households across India which is a significant rise over earlier estimates of about 22 million. Public broadcaster Prasar Bharati has notified new guidelines for the allocation of slots on free direct to home (DTH) platform DD Free Dish, which has an estimated 30 million customers. With policy guidelines in place, Doordarshan will conduct the 38th online e-Auction for filling up of vacant MPEG-2 slots of DD Free Dish DTH Platform with effect from 11 February. 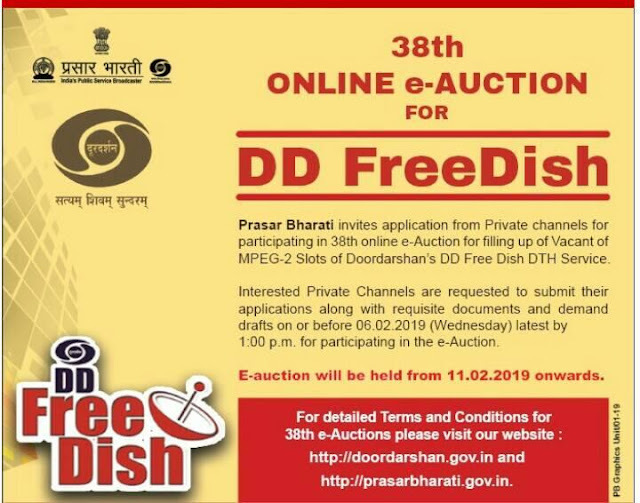 A notice has been issued inviting applications from eligible satellite TV channels for allotment of slots of DD Free Dish DTH Platform through 38th online e-auction process. Under the new guidelines, the pubcaster will follow the e-auction mode of allocating slots to private satellite TV channels. As many as 56 slots will be up for grabs after discounting the 26 slots reserved for DD/Lok Sabha/Rajya Sabha channels. The DTH platform has 80 slots on its platform. Prasar Bharati will allot MPEG2 and MPEG4 slots separately. The guidelines will have differential pricing for different genres. TV channels will be allowed to bid only in e-auctions specific to the genre (language) they belong to. Five buckets have been created for e-auction of MPEG2 slots. With a reserve price of Rs 15 crore, Bucket A+ has been kept for Hindi GECs and Teleshopping channels while Bucket A has been dedicated for Hindi movie channels with a reserve price of Rs 12 crore. Hindi music, sports, and Bhojpuri GEC and movie will form part of Bucket B which has a reserve price of Rs 10 crore. All News& Current Affairs (Hindi), All News& Current Affairs (English) Channels and News& Current Affairs (Punjabi) Channels are under the Bucket C which has a reserve price of Rs 7 crore. The Bucket D with a reserve price of Rs 6 crore will comprise of all other remaining genres/language channels. In its policy guideline document, the pubcaster has said that the reserve price has been determined on the basis of the commercial potential of the genre. In the previous regime, the pubcaster had only two categories – news and non-news – while auctioning slots. The reserve price for news channels was Rs 6.5 crore while the same for non-news channels was Rs 8 crore. In the first five rounds, e-auctions will be held for five slots or the number of applications received for each bucket. After the above, the remaining slots will be auctioned bucket wise starting again from bucket A+ and will progressively go from bucket A+ to bucket D till such time there are no more bidders in a given bucket or there are no more vacant slots left. This, the pubcaster said, will ensure a fair genre-wise distribution in the Free Dish bouquet. As was the case earlier, the e-auctions will be held on an annual basis for all vacant slots for a period of one year. The e-auction will be held at least one month in advance of the expiry of the Annual Agreement of TV channels placed on DD Free Dish. Bidding in the e-auction will be conducted in multiple rounds starting with genres with highest Reserve Price and progressing in descending order of reserve price by genre (language) till all vacant unreserved MPEG2 slots are filled up. The payment terms for successful bidders upon award of a slot will be revised to ensure a sustainable cash flow while lowering entry barrier across genres to encourage maximum participation of bidders in e-Auctions. To promote the DD Free Dish authorized set-top boxes (STBs), bidding in e-auction of vacant unreserved MPEG-4 slots will be open to all genre (language) at the same invitational Reserve Price that is irrespective of the genre (language). Placement of regional channels of Doordarshan that are currently not available on DTH/Cable may be considered for placement on vacant MPEG4 slots reserved for the same. Bidding in the e-auction of vacant unreserved MPEG-4 slots will for an initial period. Unlike MPEG2 slots, the MPEG4 slots will be open to all genre (language) channels at an invitation reserve price of Rs 5 lakh.